If you’re looking for a unique gift for the man in your life, a world map will make a great addition to his study, office or lounge room. 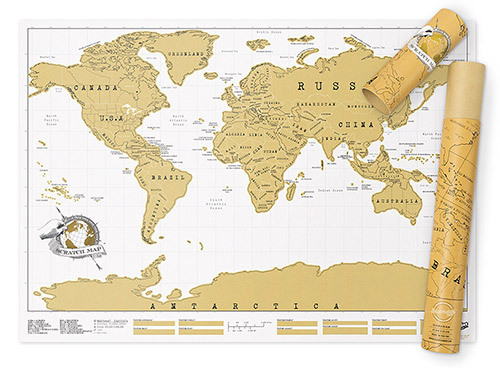 Choose from the muted colours of an antique map or choose a bright, political world map. Use wooden mounts and string to hang your map to continue the vintage theme or use a more modern look of frames or laminate for a long-life. 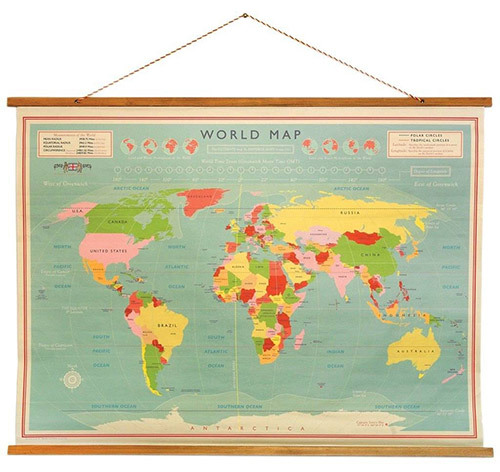 Try this already mounted vintage world wall map or a vintage corkboard world map which comes with pins. If you have a space to fill on your kid’s bedroom wall, you can’t go past a map. It looks great and as a bonus it’s educational (just don’t tell them). You can find a map to suit the colour scheme of the bedroom. The map can be hung over the bed, desk or blank wall. Compared to most other decorative pieces, world maps are an inexpensive way to fill a large space. 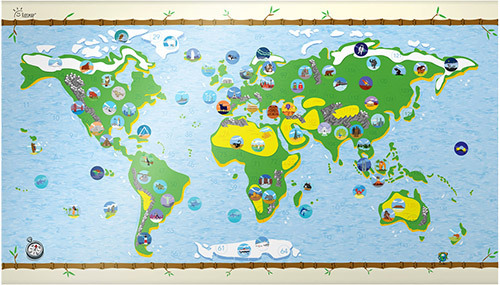 The Awesome Map Kids Map is interactive as well as decorative. Let the kids attach the stickers and write with a whiteboard marker on the coated map. If you are looking for a present for a keen footballer, you can’t go past the Awesome Maps Football Maps which shows national team stats, top scorers and fun football facts. Teenage boys wanting a grown up bedroom will appreciate the addition of a world map on their wall. If his bedroom is brightly decorated, go for a travel map but if there are muted colours look at one of the vintage maps. If the teen is a keen surfer, the Awesome Maps Surftrip Map will allow them to plan their ultimate worldwide trip with 1000 surfing spots worldwide, information about wave quality, water temperature, peak season and shark attack risk. For divers, there is the Awesome Maps Dive Map listing over 500 dive sites with their underwater features. 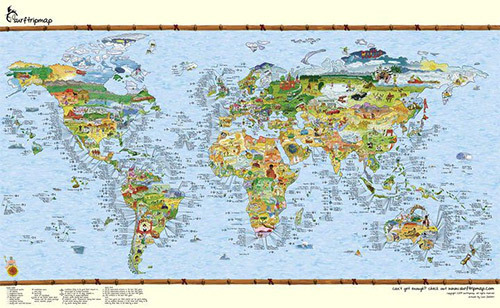 There is no better way to teach kids than with a large world map. Laminate to increase their life and use them year after year. 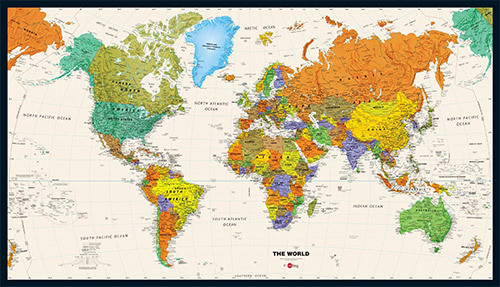 The Contemporary World Wall Map uses bright, attractive colours to display international boundaries and national capitals, physical features such as mountain ranges and deserts and water features. 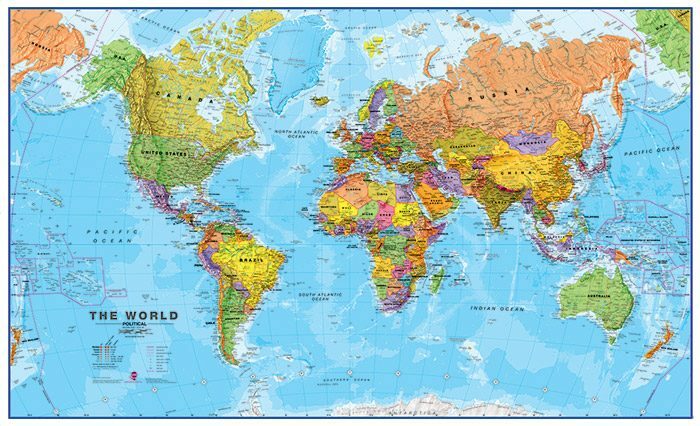 The huge World Supermap won’t look lost on the classroom wall and will allow the whole class to gather around to see the political map with towns, cities and capital cities marked. If you are looking for a present for someone that’s hard to buy for or has done some travelling, scratch maps make a popular gift idea. The World Scratch Map allows them to scratch off the places they have been to reveal bright coloured countries underneath. The Awesome Maps WTFact Scratch Map comes covered in a silver scratch-off layer which can be scratched after guessing a country’s fact based on a hint and illustration. If you are looking for the perfect map for a gift, simply let us know the type of person you are buying for and we’ll give you our best recommendations. Visit the Chart & Map Shop in-store, call us on 08 9335 8665 or via email.